There is certainly some rigidity to it at first. Some of our kiddos take longer to learn particular skills which can take a lot of repetitiveness and practice. We’ve practiced A LOT! lol! I can also see where others may perceive it as trying to force change on an individual, or trying to make them into someone that they are not. In our experience, it is strictly about teaching a particular skill or appropriate behavior. 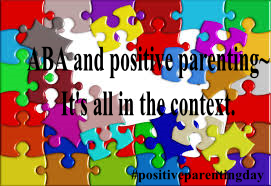 Though ABA breaks it down to its simplest form, broadening and generalizing over time has been what is key for us! And it is always important to remember the INDIVIDUAL! ABA is abuse. Pure and Simple. I am sincerely sorry that you had a terrible experience with ABA, Richard! Unfortunately in our complex world, very few things are ever 100% pure or simple. In fact they are in this case. ABA is predicated on a compliance model of no compromise. It allows no compromise and insists on complete compliance. It is an abusive practice, it takes no account of Âûtistic voice, will and preference. It takes account of so called socially unnaceptable behaviour and not of any other aspects of the human condition. There is no consideration of thought, feeling and will. No consideration as to the factors behind behaviour and no consideration of the very real truth that all behaviour is communication. Again, I’m sorry if your experience with ABA was as you describe.